16 students of Class XI participated in the prestigious Luminous2k17 organized by De Paul Institute of Science and Technology, Angamaly on 11th January 2017 and won the overall trophy. Kum. Alena Tony Thomas and Kum. 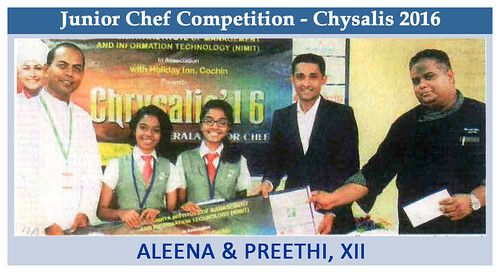 Preethi Jose of Class XII took part in the All Kerala Junior Chef Competition “Chrysalis-2016” held at Naipunya College, Pongam on 24th November and won the Junior Chef title among 14 schools. They have received a cash price of Rs. 10000 and gift vouchers for two days’ stay at Holiday Inn Resort, Kochi. 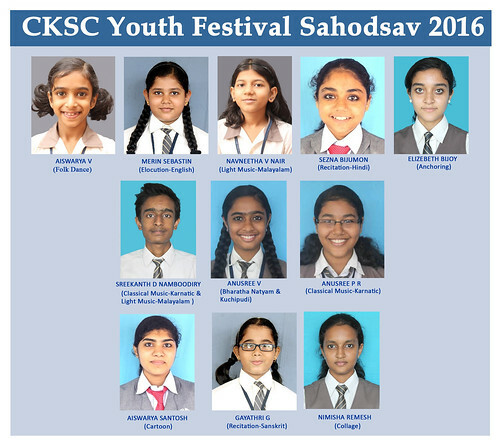 The school team participated in the individual items of the CKSC Youth Festival “Sahodsav 2016” held at Santhal Jyothi Public School, Muttom, Thodupuzha on 8th November 2016. 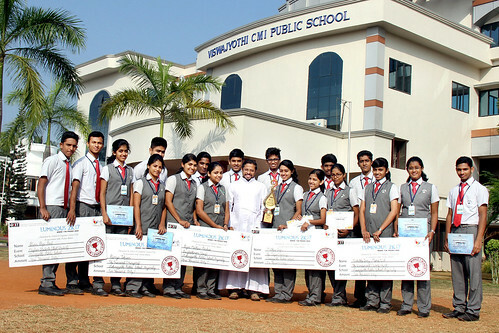 Out of 104 schools that participated, Viswajyothi CMI Public School came in the 8th position. GOLDEN PLUMES ON THE TIARA – Viswajyothi’s talented artists with the proud Overall Runners Up trophy of ‘VISTA’, conducted by Rajagiri Public School, Kalamassery. 29 students participated in the spectacular event FRESCO hosted by Rajagiri Christu Jayanthi Public School, Kakkanad on 8th July 2016 and the kids unveiled their own creativity and passion in two events FASHIONISTA – a fashion show and MEDLEY MANIA-a musical band show, by bagging 2nd prize for each. The school team participated in the CKSC Youth Festival conducted at Nirmala Public School, Muvattupuzha. 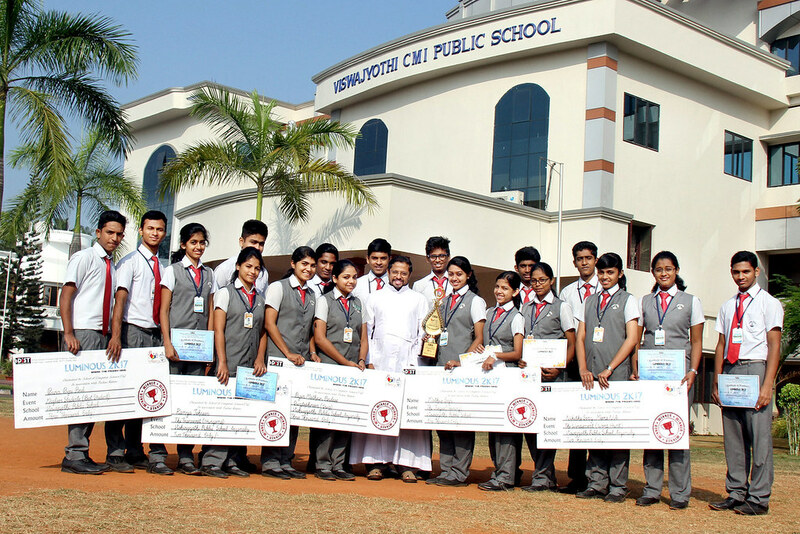 Out of 64 schools that participated, Viswajyothi CMI Public School came in the 7th position. The school team participated in the most prestigious cultural extravaganza FABULA 2015 organized by Rajagiri Sr, Secondary School, Kalamassery on 3rd October and won cash prize and overall trophy. In the Central Kerala Sahodaya cultural competitions held at Vimala Public School, Thodupuzha, Viswajyothi bagged the ever rolling trophy in category IV with 236 points and in the overall grading, Viswajyothi reached the third position with 592 points. This is a remarkable achievement because we took part only in a few items and most of the participants bagged the 1st prize in which they participated. GOLDEN PLUMES ON THE TIARA – Viswajyothi’s talented artists with the proud Overall trophy of ‘Vista’, conducted by Rajagiri Public School, Kalamassery. MORE GEMS TO THE DIADEM – A recognition to the proven talents – Viswajyothians with the first runners up trophy of INSIGNIA-2012, conducted by Bhavan’s Varuna Vidyalaya, Kakkanad. The All Kerala CBSE State Kalotsav-2014 held at Sarvodaya Central School, Nalanchira, Thiruvanthapuram from 14th to 16th November 2014 turned to be a colourful achievement for the viswajyothians. Around 40 students took part in this three day gala Event and the school team won many accolades. The first prizes for the group song, patriotic song, western music, guitar and recitation were sweets of pleasant surprise. The State Kalotsav was truely an enriching experience for the students.